More than 3,400 people completed an online survey about their preferences relating to a future grocery store at the Hyde Park Shopping Center. The survey was open from November 1 through November 18. 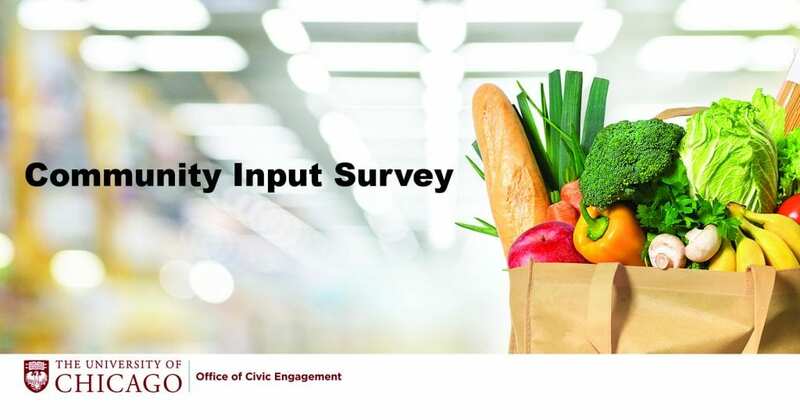 Shared by the University of Chicago’s Office of Civic Engagement (OCE) and Real Estate Operations (REO) group, the survey questions included the respondent’s zip code, number of years shopping at the former Treasure Island Foods store, favorite aspects of the former store, where the respondent has been shopping since the closure, importance of various grocery store attributes, relationship to the Hyde Park area (live, work, or live and work), number of years living and/or working in Hyde Park, in addition to basic demographic information. The top five reporting zip codes were 60615 (1,836 responses), 60637 (1,083 responses), 60653 (169 responses), 60649 (71 responses), and 60616 (20 responses). The majority of respondents had shopped at the Treasure Island Foods location for 7-10 years (45%), followed by 1-3 years at 30%, 3-5 years at 14%, and 5-7 years at 11%. Respondents were able to select one or more of their favorite aspects of shopping at the former Treasure Island Foods store. Proximity to home and work was the favorite aspect of the Treasure Island Foods location (81%), with the produce department at 47%, specialty items at 45%, bakery at 39%, deli/prepared foods at 32%, meat/fish department at 31%, community involvement at 28%, employees at 20%, holiday trees/pumpkins/plants at 15%, and the liquor department at 13%. Respondents were able to select one or more features important to them for a future grocery store at Hyde Park Shopping Center. Respondents rated the most important future grocery store features as produce department at 79%, followed by price/value at 65%, meat/fish department at 57%, specialty items at 46%, and early/late hours at 42%. The majority of respondents were female (69%), compared to 28% male. The 25-34 age group was best represented at 25%, followed by 35-44 at 22%, 45-54 at 16%, 65+ at 13%, 55-64 at 11%, and 18-24 at 10%, and under 18 at .15%. Respondents were most likely to live and work in Hyde Park/surrounding area (51%), followed by those who only live in the area (49%), and those who only work in the area (5%). The majority of respondents reported living and/or working in Hyde Park for 0-5 years (35%), followed by 20+ year long-term residents at 26%, 5-10 years at 18%, 10-15 years at 12%, and 15-20 years at 8%. Since the Treasure Island Foods closing, the University of Chicago’s Office of Civic Engagement (OCE) and Real Estate Operations (REO) group have been actively meeting with grocery store operators and those meetings are continuing. Through the survey, respondents provided specific feedback on the grocery operators they would like to see in the Hyde Park Shopping Center, and we reaching out to all of them. Every potential grocery operator conducts an independent analysis to understand if the specific space and the overall market meets their development and operating criteria. Because the lease term with a new tenant will be a minimum of 10 years, there is a great deal of due diligence on both the part of the tenant and the landlord that must be completed. We appreciate that so many people took the time to complete the survey, sharing their insights and preferences for a new grocery store. We look forward to sharing more information on the process to secure a new tenant for the space as it becomes available.